Third in a series on nitrogen fixing legume plants. 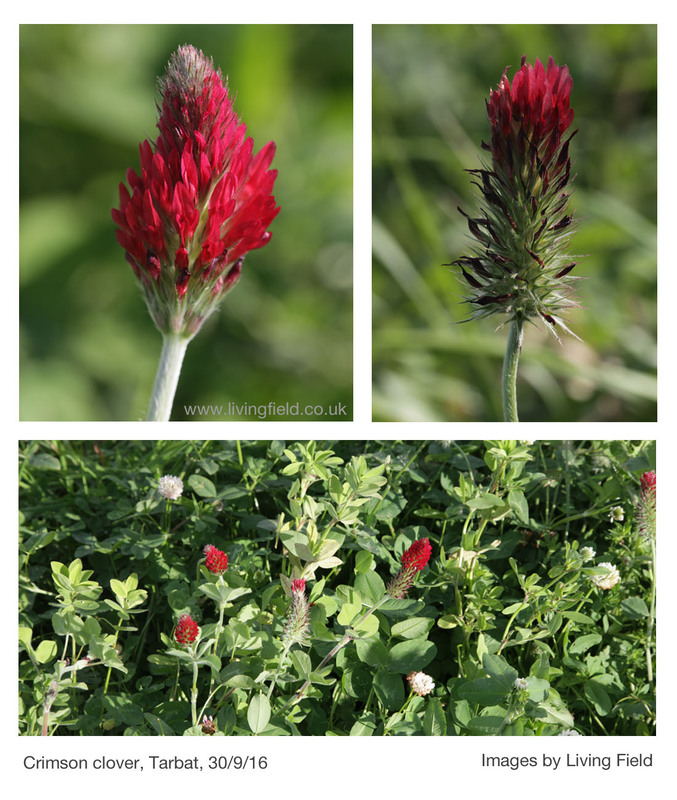 The crimson clover Trifolium incarnatum ssp incarnatum was once grown widely in the south of Britain and trialled in the north, where it never found favour as a forage ley compared to the white and red clovers. 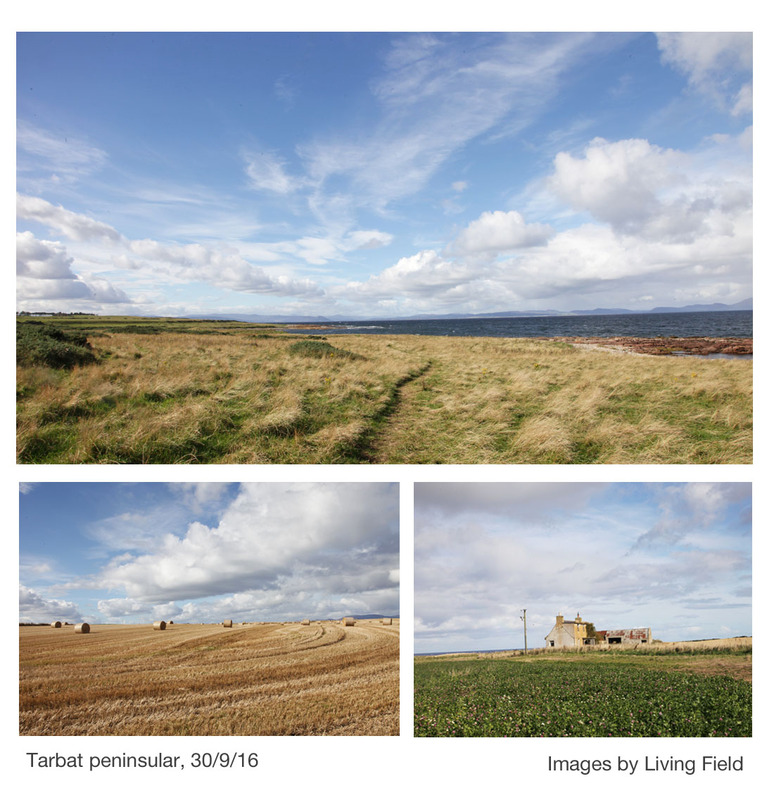 So a small field of mixed legumes in Tarbat, a few miles south of Portmahomack, was unusual. Crimson clover was the most visible of the plants, in full flower late September, but the patch also contained red clover, two white- flowered clovers and a few other plants. On its margins a stray sainfoin appeared, probably a relic from a previous sowing. Crimson clover was noted in Lawson & Son’s Vegetable Products of Scotland (1852). They report that, if sown in autumn, it can be cut in June the next year ‘…. and the land fallowed for wheat or spring corn’. They report that is makes a valuable green food for cattle and when cut in full flower ‘it makes a more abundant crop, and a superior hay to that of common clovers, at least it is more readily eaten by horses’. They also report a comparison of ‘common crimson clover’, a variety of it named ‘late-flowering crimson clover’ sourced from Toulouse in France, and Moliner’s clover which was said to be grown in France and Switzerland. The late flowering variety came out top. In modern taxonomy, the only one of these native to Britain is now called long-headed clover Trifolium incarnatum ssp molinerii, white-flowered, but that is found at only a few coastal sites in the south of Britain. This is likely to be the same as the Moliner’s clover mentioned by the Lawsons, but their seed was most likely sourced from European seedsmen rather than from the wild in Britain. Crimson clover is now Trifolium incarnatum ssp incarnatum. Moliner’s and crimson are therefore considered sub-species (ssp) of the same species. So what was it doing here? It was probably sown in a clover mix as a legume contribution to CAP Greening measures (see Sources). As can be seen the mix was luxuriant in foliage and flower well into autumn, when many other wild plants were dying or seeding. 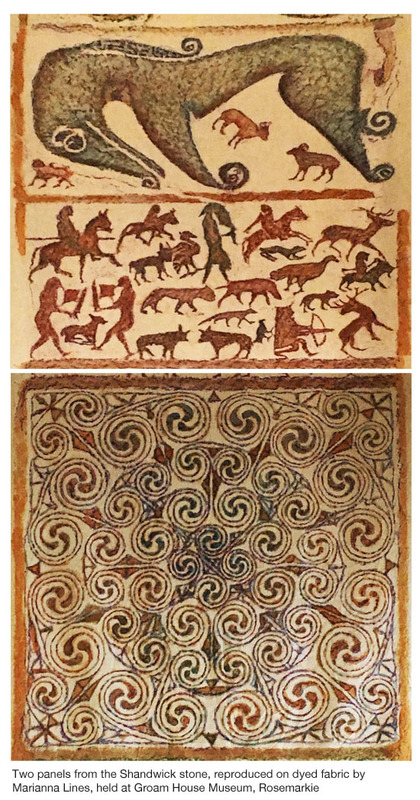 Tarbat is a rich agricultural region, and you can see why the Picts farmed and established their monastery and unique monuments here over 1000 years ago. Today, small fields and patches like the one shown offer refuge and food for insects and birds in a landscape dominated by grazing land, and harvested or ploughed fields. Taxonomy from: Stace C. 1997. New flora of the British Isles 2nd Edition. Contact: geoff.squire@hutton.ac.uk. 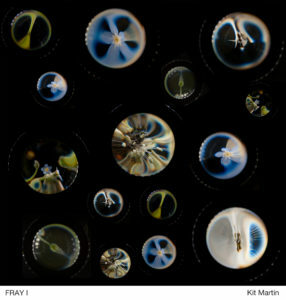 Images are the property of the Living Field project. The restharrow Ononis repens is a tough plant, growing as it does at the very limits of dry, salty land around the coast. 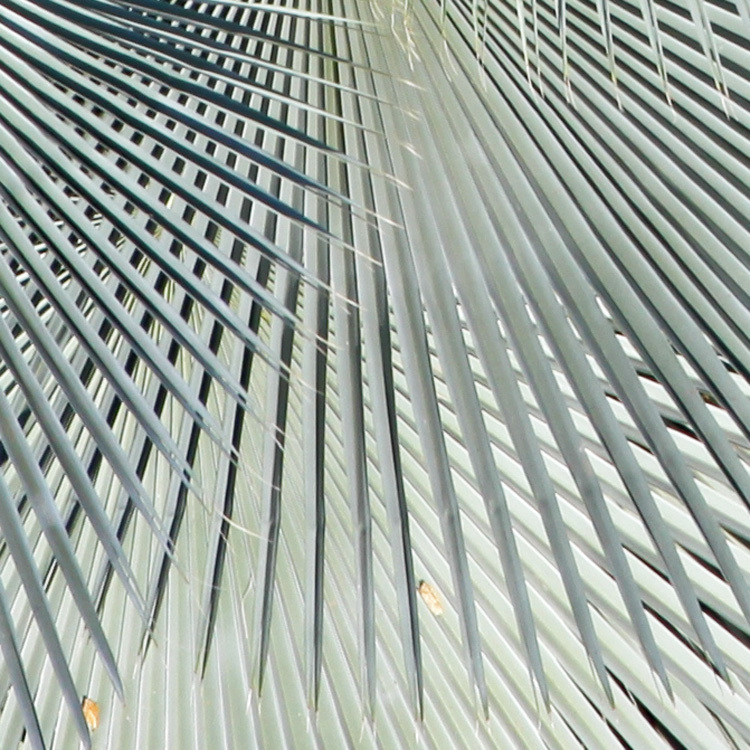 There it will fix nitrogen from the air, which finds its way through decomposition of roots and leaves into the sand and then perhaps to other plants and to soil microbes. It was also once a serious weed of cropland, as its name suggests, but a weed no longer, tamed by heavy ploughs and pesticide. 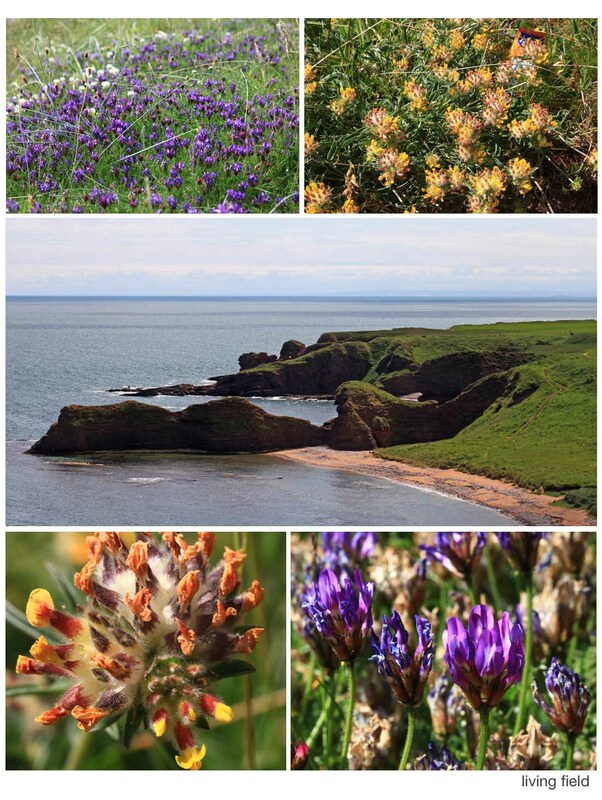 It grows well around the coasts of Angus and Moray. 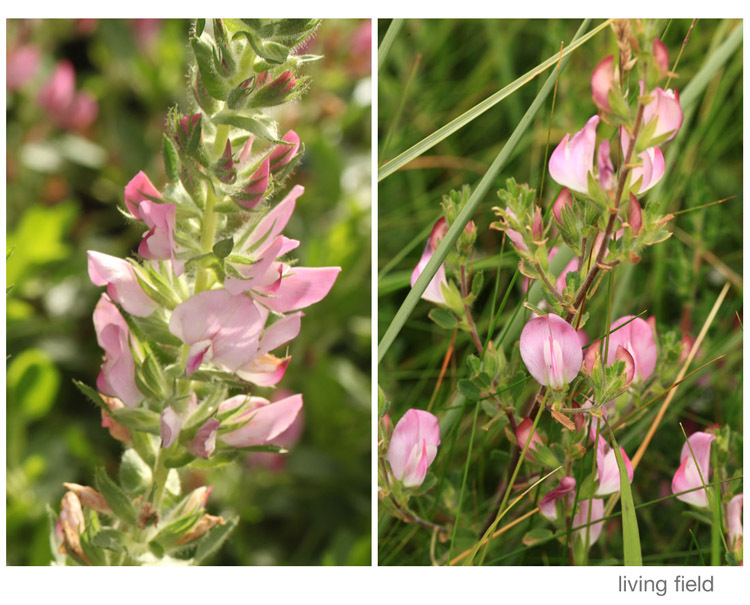 In Montrose bay, it grows in abundance, the main legume of the dunes. It is prolific near the south end, particularly around the car parks, binding the sand as it once slowed the harrow. To the north over the several miles of beach, it lives at the base of the collapsed dunes (images above), leaf and flower blasted by salt and sand grains. 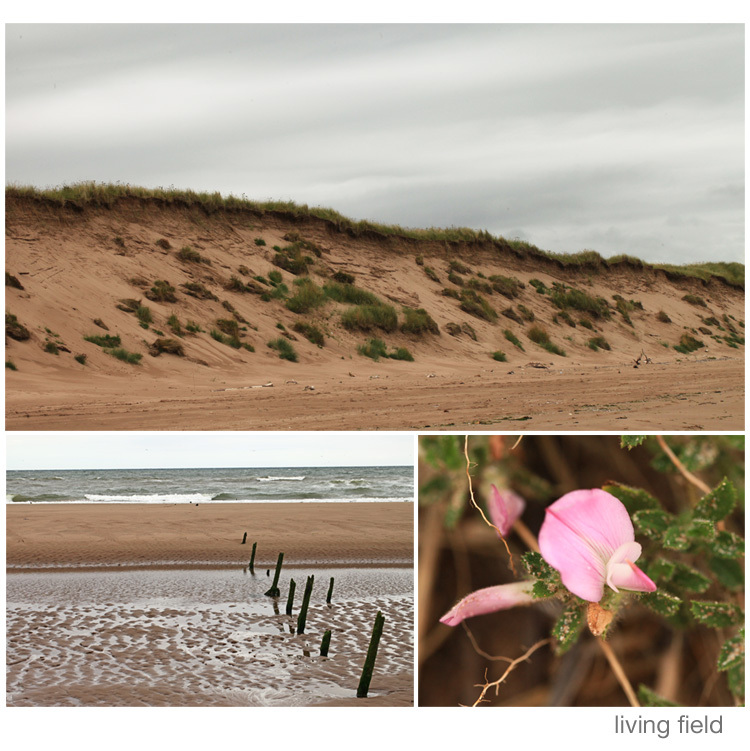 In the images above, the line of stakes leading seaward from the dunes reaches out into the North Sea at its widest and after 650 km of rough water, meets the coast of Denmark. The restharrow is the first line of defence. Grigson gives the mediaeval names of the plant, one of which resta bovis translates as ox-stop, and cites a treatise of 1578: ‘the roote is long and limmer, spreading his branches both large and long under the earth, and doth ofttimes let, hinder and staye, both the plough and oxen in toyling the ground’. In her 1920 book, Winifred Brenchley classed restharrow Ononis repens among ‘coarse growing plants that deteriorate the quality of pasture or meadow’. And in the last century it seems to have been a problem in grass rather than in land that was repeatedly tilled. Long placed it in the top 30+ weeds of pasture, but did not always distinguish the spiny Ononis spinosa, which has a more southerly distribution in Britain, from Ononis repens which is the one shown here in the photographs and which was described by Long as having runners, usually spineless and with a strong disagreeable scent. Grigson relates its presence in pasture as tainting milk, butter and cheese and children chewing its root, which gives it the name wild liquorice. A few patches of restharrow remain in a remote corner of one of the Institute’s farms near Dundee. 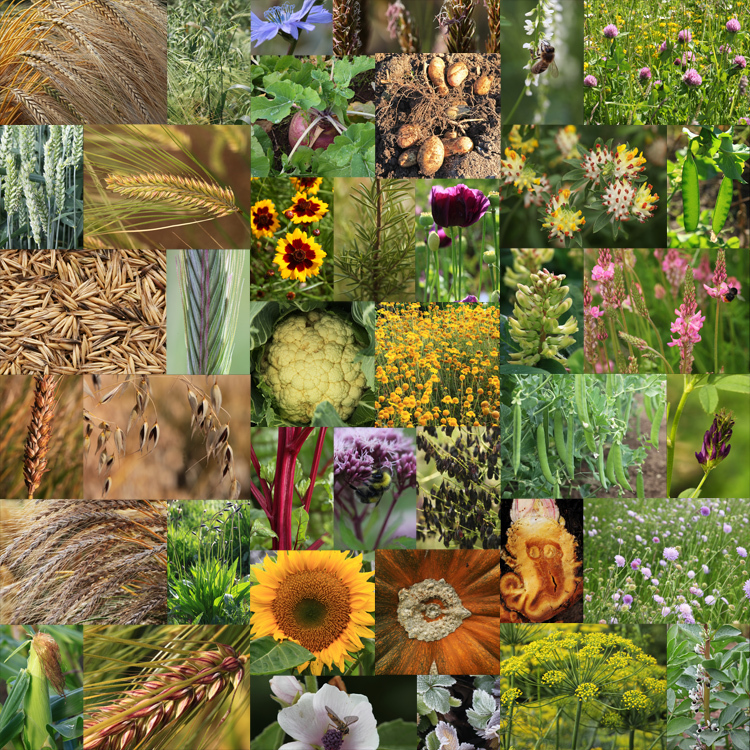 To see what it looks like and how it grows, the Living Field garden keeps a small patch of it, originating from seed. Its luxuriant foliage and flowers grow to well over 0.5 m in height and attract a range of insect feeders. It is cut back to 10-20 cm above soil level in autumn, but is otherwise left to itself. Its leaves and stems are softer in the garden, less wiry than at the edge of the North Sea (comparison above). 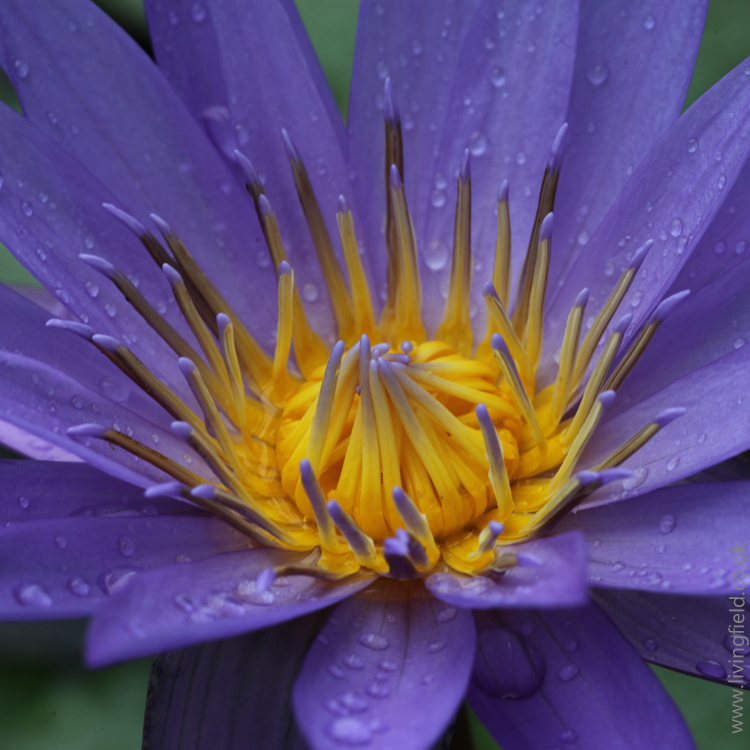 There are also small variations in geometry of the leaves and sepals. Brenchley WE. 1920. Weeds of farm land. Longmans, Green and Co, London. Grigson G. 1958. The Englishman’s flora. (Paladin, 1975). Long HC. 1938. Weeds of grass land. HMSO. Note: on sampling the coastal plants, Euan James reports nodulation, indicating they are fixing nitrogen. Contact/date: GS 30 July 2015. The kidney vetch Anthyllis vulneraria was noted in a recent post about nitrogen-fixers living by the shore on the east coast of Angus. But the kidney vetch has wider acclaim as host of the rare Small Blue butterfly Cupido minimus. The small blue lays its eggs in the flowering heads of kidney vetch. The hatched larvae then eat the flowers and the developing seed. In the latter can be found people to contact if you want to take part in surveys or to report sight of the butterfly. 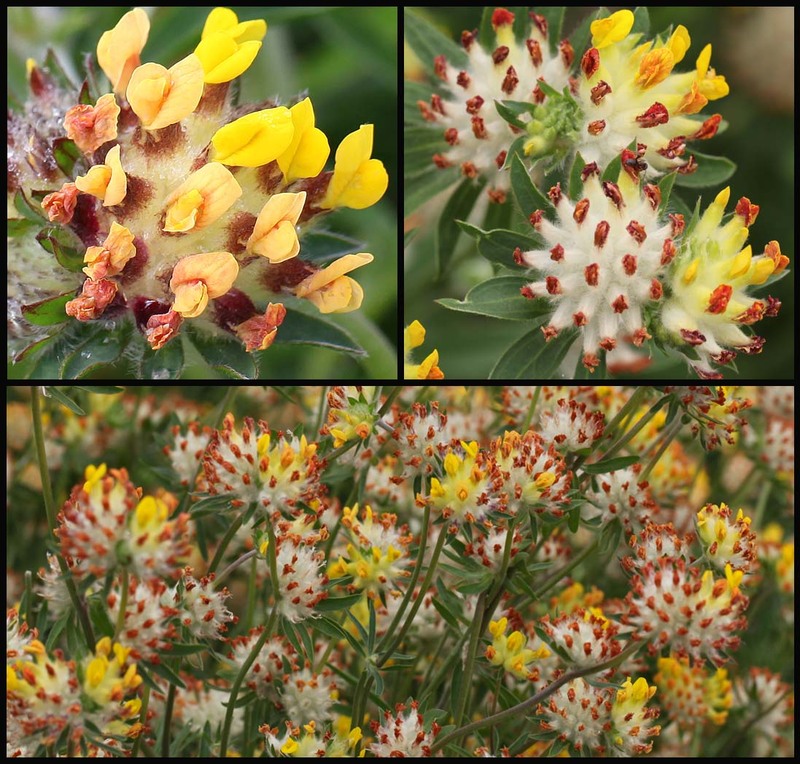 The kidney vetch is one of the nitrogen-fixing legumes that occur in nitrogen-poor, dry and unshaded environments around the coast of eastern Scotland. Yet it was once considered as a sown forage – a constituent of vegetation managed for stock-feeding. Lawson and Son (1852) write that it ‘does not yield much produce, but is eaten with avidity by horses, sheep and cattle, and also by hares and rabbits, and might therefore be introduced into mixtures for very dry soils’. 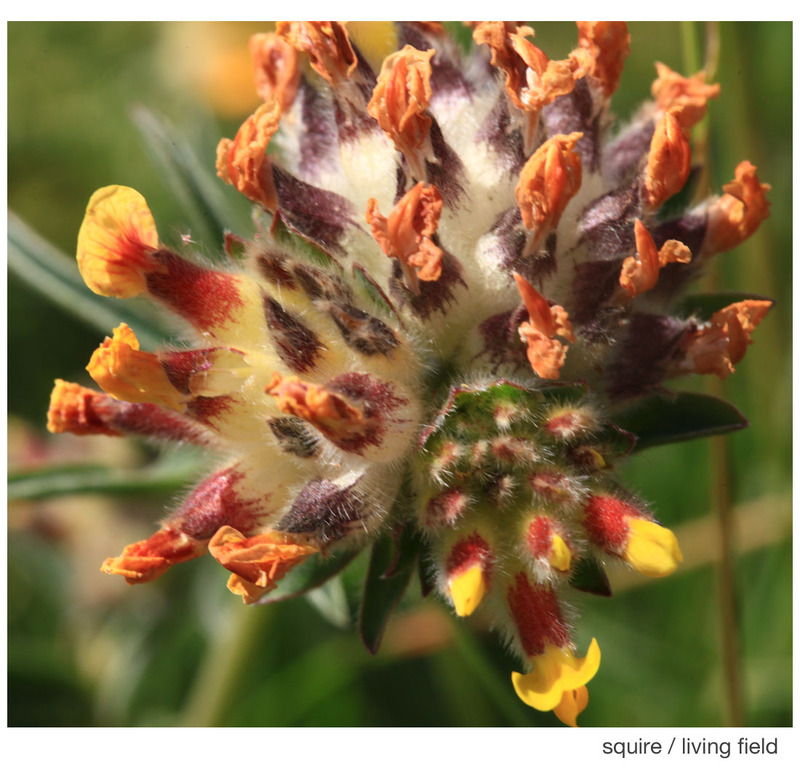 The Living Field garden grows kidney vetch in its medicinals collection and in the raised beds that have housed a legume collection over the past few years (images below). It grows well, forming luxuriant clumps up to 30 cm in height, taller than on the coast. The flowers are usually more yellow, less red than on the wild plants. It flowers and seeds profusely in the garden. Some plants die in the winter, but in the last two years it has regenerated freely from its own dropped seed. The round ‘wooly’ heads may be confusing at first sight, but each ball consists of usually three separate heads each holding many individual flowers. The three heads do not all flower at the same time. In the image at the top of the page, the head to the lower right is the latest to flower – some flowers are still in bud while others have the fresh yellow petals emerging from the red calyx tube (which previously enclosed the bud). The head to the left has a mix of new and withered flowers. The largest one, at the top middle and right, has finished flowering: all petals are withered orange, the calyx tubes have turned purple and the hairs have expanded into a whitish mass, protecting the seeds that will form deep in the tubes. Lawson and Son. 1852. Synopsis of the vegetable products of Scotland. Authors’ private press, Edinburgh. First in a series on nitrogen fixing legume plants. Legumes are a group of plants that ‘fix’ nitrogen gas from the air to make proteins that are essential for growth and survival. When legume tissue dies, the nitrogen (N) is returned to the soil. Legumes have many uses to people as food, medicinals and dyes. 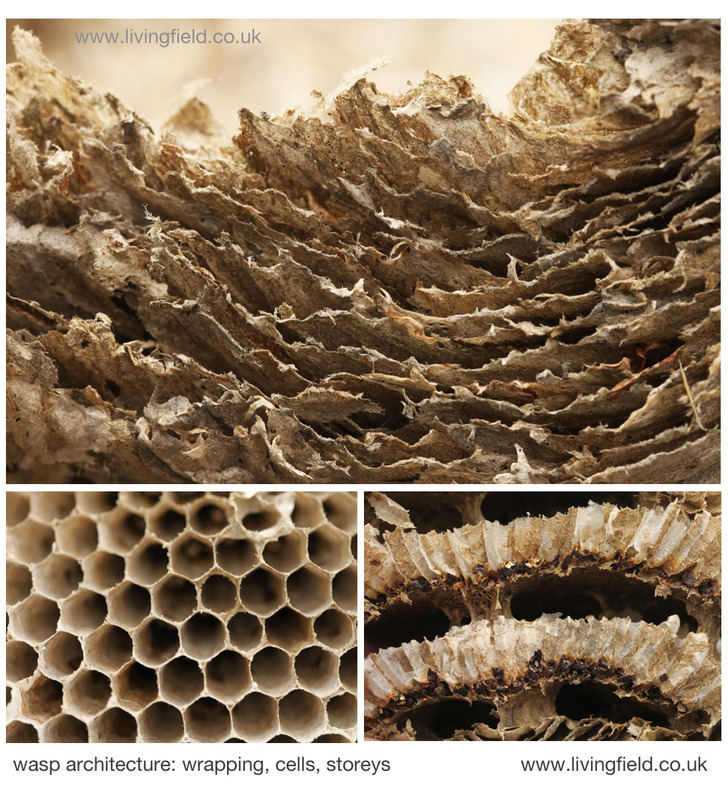 They also support insects that in turn carry out ecological functions such as scavenging and pollination. Here we begin a short series on wild N-fixers. First are those that live by the eastern shores of Angus. The east coast of Angus (middle image) is rich in wild legumes. Those shown here live just above the beach or on top of the cliffs, where the vegetation is short and there are no bigger plants to out-shade them. Top left is a patch of purple milk-vetch Astragalus danicus and white clover Trifolium repens behind, top right kidney vetch Anthyllis vulneraria with litter, and ( bottom) flowering heads of kidney vetch (left) and purple milk vetch. 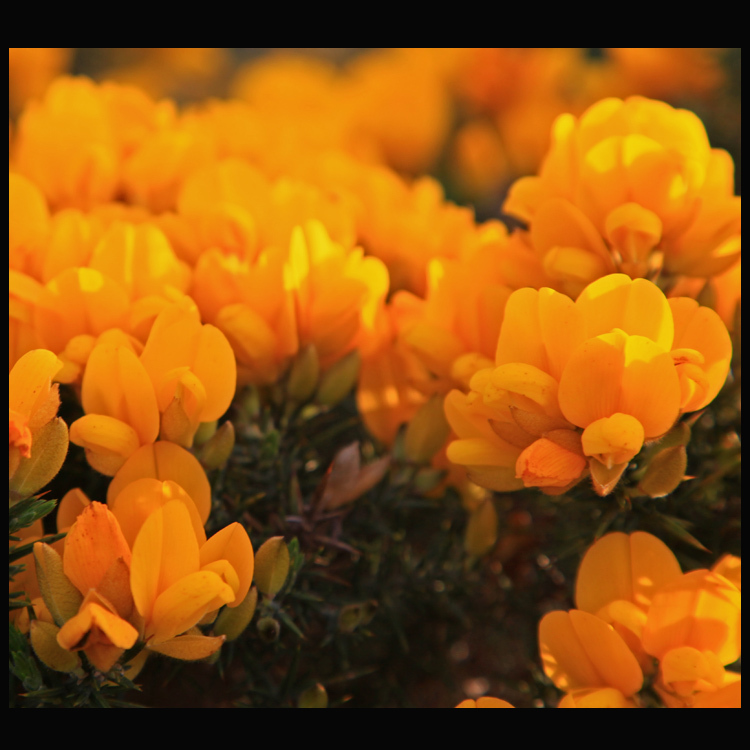 Nearby were patches of meadow vetchling Lathyrus pratensis, bird’s-foot-trefoils Lotus species, and on the cliff-tops bush vetch Vicia septum, gorse or whin Ulex europaeus, broom Cytisus scoparius and the introduced laburnum Laburnum anagyroides. One reason for the presence of legumes here is an unfarmed habitat, low in nitrogen. Fixation by the legumes is one of the main routes by which the plants and soils get their essential nitrogen. Most of these wild legumes have been tried over the last few thousand years as crops or forages. Some such as kidney vetch have been well-know medicinals (a vulnerary is a herb for treating wounds). Few have remained useful to agriculture, perhaps the best known being white clover, still cultivated today to enrich grass fields with fixed nitrogen. Legumes are of the pea family Fabaceae, previous known as Leguminosae.